Toyota is investing $US100 million in tech start-ups. Toyota Australia this month exported its one millionth vehicle to the Middle East. Toyota is Australia's biggest vehicle exporter with almost 70,000 locally built cars shipped during the year to March 31. Toyota Australia has become the first Australian car manufacturer to export more than one million vehicles. Toyota Australia's John Rowan and Sam Rigopoulos (right) with a Hybrid Camry in front of a safe driving sign. Toyota will become the first Australian carmaker to export 100,000 vehicles in a year. Left-hand-drive export Camry shown. A record 79,600 Australian-produced Toyota cars were exported in 2006 - an increase of almost 11,000 on the previous year. Pictured are sixth-generation Camry sedans ready for export to the Middle East. 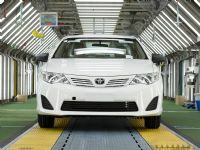 New Camry, which is the only four-cylinder car built in Australia, is destined for more than 20 export destinations, including New Zealand and the Pacific Islands, with the majority going to the Middle East. The all-new Toyota Camry, which is the only four-cylinder car built in Australia, is destined for more than 20 countries, including New Zealand and the Pacific Islands, with the majority going to the Middle East.